Treadwell’s conductive grating drains off the build-up of unwanted, dangerous static electricity when grounded. 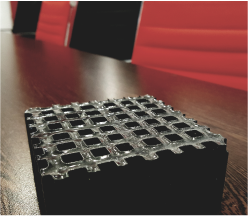 This specialised grating produces an electrical resistance of less than 26 kilo-ohms per foot, while retaining other desirable characteristics of conventional FRP moulded grating. 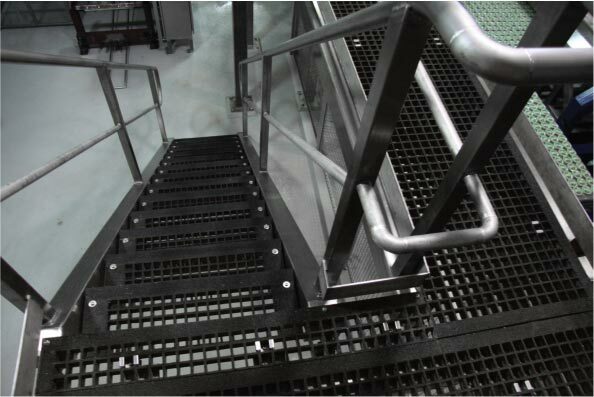 FRP gratings are typically non-conductive and this can sometimes present a safety issue when in a sparking sensitive environment due to the build-up of static electricity. 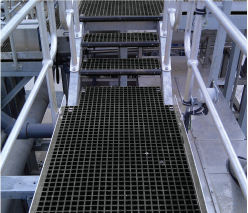 Treadwell’s conductive grating has a black carbon surface which is specially formulated to discharge static build-up on FRP grating surfaces in areas where static build-up presents a significant risk. When properly grounded the conductive surface provides solutions that can be typically applied in areas where there are highly sensitive electrical equipment, munitions, chemical or petrochemicals present. The Treadwell moulded carbon top can be applied to any of the grating products specified in our range and can be combined with any of our resin formulations.